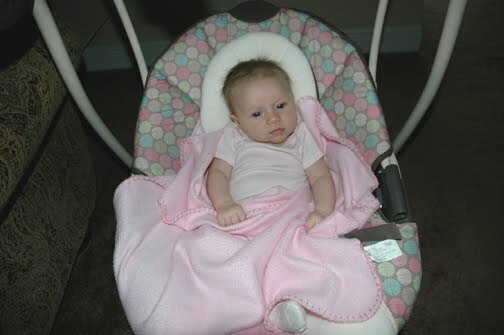 Adelyn is finally liking to sit in her swing. It's great to have a place to put her that she enjoy's. She will sometimes take naps in it and when i'm cooking dinner I put her in it and put it right next to the kitchen so she can see me. She has the cutest little play mat to lay on but just isn't interested in that yet either. I remember when Andon was a baby, he LOVED his swing and then after the swing he LOVED his exersaucer. I haven't got one of those for her yet but i'm sure we will.